Yay! Hip, hip hooray! 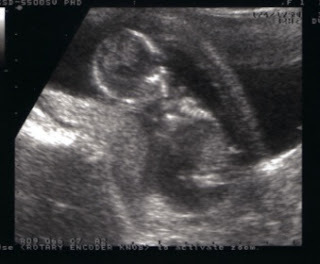 I’ve finally had my scan – but I only just got to have it!!!! On Thursday, after the post was fruitless again, I decided to call the hospital again to find out the date of my scan date. It had been a week and a half since I had rung them last. Well, I rung at 11.15 and she told me that it was actually that day and would I be able to get there for 12!!! I spoke to Stuart and he was really upset that he wasn’t going to be there so he asked me to call back to see if I could push it back a bit later that day. Thankfully, they could and said to just get there as soon as we could before 4pm. We actually got there at 1pm in the end. It was great! 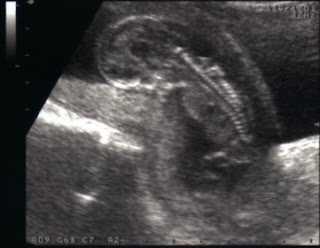 We could see the baby and could see it wiggling. The measurements were taken to check its size and it was perfect for the dates I had. Then it kept misbehaving when she did the Risk of Down’s Syndrome test as it wouldn’t get in the right position. I had to go and empty my bladder to see if it would move. It did in the end and the risk was really low. Apparently, it is not necessary to turn up to the first scan with a first bladder but I didn’t know that and had purposefully not been to the loo because I thought that is what I was meant to do. However, you could really tell the difference in clarity between having a full bladder and not. It was much clearer before I went to the loo. Stuart and I were both really excited. It had been a really stressful and nervous day for Stuart so was a big relief for him to see everything was ok. So, now we have finally told everybody and have confirmed with the parents that they can now tell people too. This means it is finally sinking in that there is really a baby in there! Quite scary now though – I’m trying not to think about it in depth too much. Funny thing is, I’ve been waiting all this time to be able to tell people but a little part of me is sad that it is no longer our little secret. No pleasing some people is there! Anyway, the appointment letter finally made it through the door today – confirming that it was indeed on Thursday. Good job I called, eh?